From an affectionate French Bulldog and astute Boxer to a sassy tabby cat, if you love animals and art, then your tail will be wagging with each of our easy-to-learn lessons and the humor that goes with them. 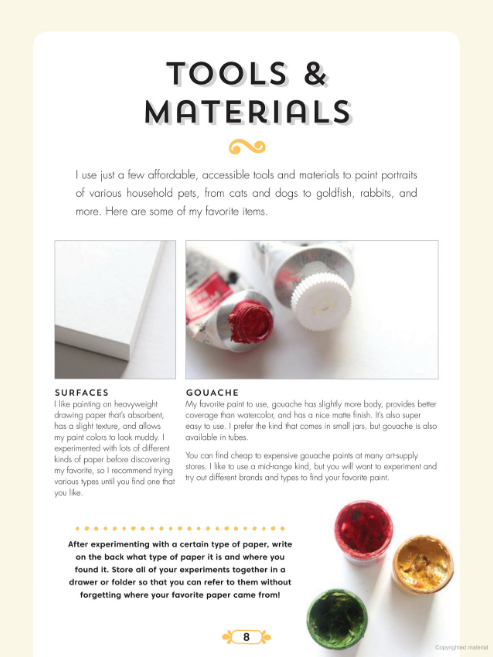 You’ll be an expert in gouache, pencil, and ink in no time! Playful Painting: Pets is the first title in Walter Foster’s new compact and portable Playful Painting series, and it is aimed at artists, doodlers, and painting enthusiasts. There has never been a better time to learn to paint and illustrate whimsical portraits of your pets and favorite animals! Startup is easy, with minimal tools and materials required. You’ll be inspired to create when you see our gallery of dozens of cute cat and dog breeds (plus mixes!) as well as birds, pigs, rabbits, and other favorites. Then, when you’re ready, dive into exclusive bonus content to see how to use finished artwork in fresh and clever ways. Artist Faye Moorhouse illustrates this book in her signature friendly, quirky style. Not an artist? Playful Painting: Pets is a perfect gift for the animal lover in your life and a must-have for anyone who’s shared their life and living space with furry or feathered friends.